1. The live video feed, in particularly from CAM5 on the NVR is still laggy with as much as 7 seconds sometimes between one frame and the next. 3. Playback on the NVR when more than one camera is selected not possible or extremely slow. 4. Why are there 3 emails for every Motion Detect alert (GMail and MWEB have already blocked sending via their SMTP servers due to excessive email)? Why send one email for a Motion Detect Event and then another with the attached Snapshot? And surely a "Clear" event is pointless on a Motion Detect? These events have to be reliable or it is pointless. Something may be of assistance is, when reviewing the live video on the NVR as compared to the same live video on my PC in Internet Explorer there is a clear difference, the live video on the NVR is laggy and breaks up but not so in Internet Explorer. I will try attach a video clip. I have sent these questions and issues to Dahua but have not had any response to date. Something may be of assistance is, when reviewing the live video on the NVR as compared to the same live video on my PC in Internet Explorer there is a clear difference, the live video on the NVR is laggy and breaks up but not so in Internet Explorer. Check to see if there is a way to get a "top" ( unix / linux ) / "task manager" style command run on the NVR so that you can see the load on the NVR. Sounds like NVR ( 4xxx model - thus a lite version, less powerful compared to the 5xxx line ) maybe hitting a resource limit. Remember NVRs are designed to record as a priority, and additional resources are then used for display. Remember NVRs are lower powered embedded systems compared to a PC. If you need a live display, consider using the PC for the display. redfive and looney2ns like this. You may need to lower the bitrate and or frame rate on a camera or two, to the point that the NVR can handle it. I was thinking along the same lines, your camera settings may be too high for your nvr to cope. 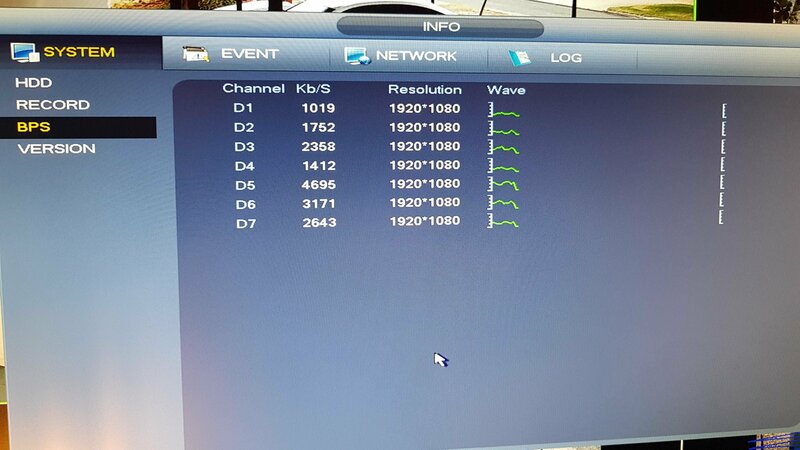 The NVR has a maximum incoming bandwidth of 80mbps. Turn down your frame rate and or bit rate a bit or switch to a different type of compression. What's overall the network topology look like? How are you using the wifi? It is a dedicated NVR device, I am not able to install any 3rd party apps. The compression is set to H.264H. I have changed it to H.265 now and will monitor for any improvements. Currently I have the Bit Rate set to 4096Kb/s and Frame Rate set to 20FPS. I have tried setting the Resolution to the lowest on all the cameras, ie. 720P, it made a little difference but still not smooth video. I also have not enabled the Sub Stream. This is what the layout is, note the 4 Litebeams (.21, .22, .23 and .24) and the 6 cameras. Not on the NVR. I have not seen any difference since changing the compression to H.265. mat200, looney2ns and CandyMan_ZA like this. mat200 and CandyMan_ZA like this. @Barboots do you perhaps make use of the Motion Detect Events and Email notifications? Yes, but I am no expert. I have moved from "motion detect" to "IVS tripwires". They false much less often. thanks Steve, I have also used and currently using IVS (Intrusion Detect) and experience similar results. Maybe reboot? I've found some settings don't "take" so well unless you do. You could try recording the cameras directly to a PC using SmartPSS, this would increase network bandwidth but would help you figure out if the NVR simply isn't keeping up or if something else is going on. The skipping has to be something to do with a bad switch or connector somewhere in your network. Try unplugging one camera at a time and see if the skipping or lag is reduced. We saw this issue on a fairly large install and come to find out, there was a 10/100 switch that was old and causing a bottle neck. We noticing skipping in the recording when recording continuously also. You may want to set your recording to continuous to see if the issue shows up there. I believe the processor works harder when recording in just motion. c hris527 and mat200 like this. 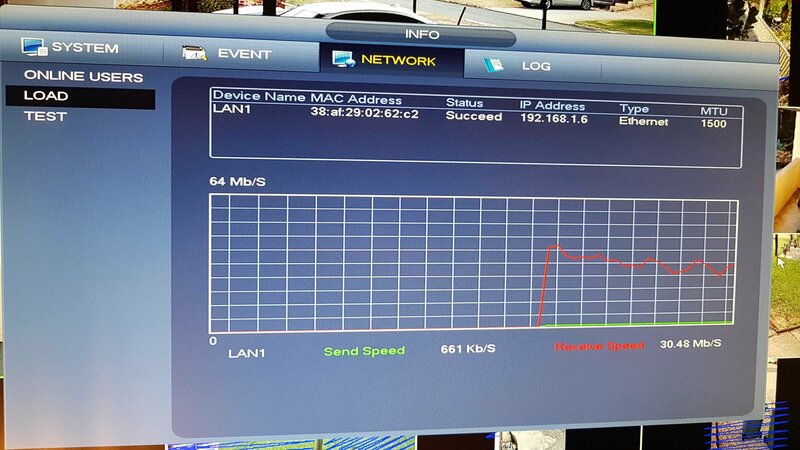 Speeds not withstanding, you can also have issues with a live video feed on wifi because every wifi device isn't transmitting 100% of the time. They have to take turns. I'm not surprised they're having issues trying to use 6 cameras over wifi. This is why I asked about network topology. A bad cable or slow switch somewhere is also possible. mat200 and fenderman like this. Sorry I missed it earlier.